Rhymes With Snitch | Celebrity and Entertainment News | : Jamie Foxx Dumps Katie Holmes? Jamie Foxx Dumps Katie Holmes? Earlier this year actor Jamie Foxx finally went public with his Katie Holmes romance after years of dating in secret [click here if you missed that]. Now that the romance is public is it no longer fun for Jaime..? 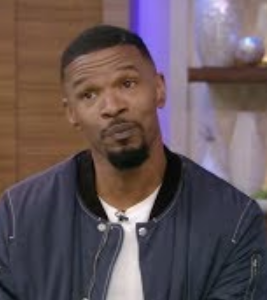 Jamie Foxx was photographed with the same glamorous brunette twice in late November and wer're not talking about Katie Holmes! "Katie is totally crushed," dishes a friend of the actress 38. "She thought going public meant they weren't going to date other people." But according to sources, the Django Unchained stud, 49, has hardly spoken to Katie since. Move along ... nothing to see here. He just shaved his beard and waiting for another one to grow back. Never let anybody keep you a secret.Bad set up from the start.Dont ever be happy to be someone's hidden plaything. It was a condition of her divorce, it wasn't Jamie's or her idea. Jaimee Foxx only dates white women. He won't date a black woman. Why? Because a black woman knows the nxgga is gay. You can't get over on a black woman with the bs. These negroes be pro black but racist as hell towards women of their own race. I've watched paint dry that was more exciting than this non couple. Jamie is a weird one; I don't really know what he is about; he loves white women or having babys with white women; this dude wouldn't look at a black women but he plays the game like he is soooooo black and down; whatever!!!!!!!! !